Play Red Hot Repeater™ online for free now! 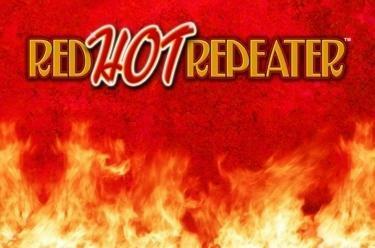 Let the flames flicker in the infinite loop - enjoy winnings over and over and over again: Red Hot Repeater™! 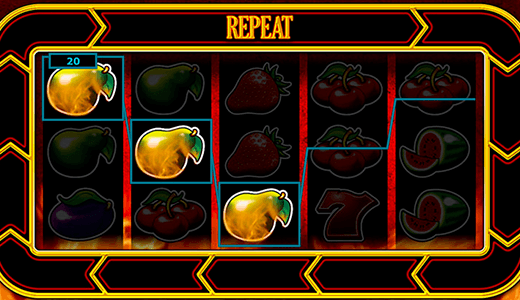 5 reels full of fruity winnings await you - get 5 matching symbols in the right order, land a winning combo and activate the Repeat Mode for the juiciest winnings since the invention of fruit slots! Your aim: Land 3 matching symbols along the 10 win lines and win! Winning combos start on the first reel on the left and run without interruption along the win line to the right. Every winning combo triggers the Repeat Mode. Now it's time for the arrow trail with a cluster of red arrows making its rounds. When the group of arrows stops and covers the "REPEAT" field you receive your initial win again and the red arrows start another Repeat round. Some Repeat wins also come along with a bonus multiplier (up to 10x). The Repeat Mode ends when the group of arrows doesn't cover the "REPEAT" field on one of their stops.